It almost couldn't get any better than the Middletown Terquasquicentennial (175th) celebration that opened last evening. 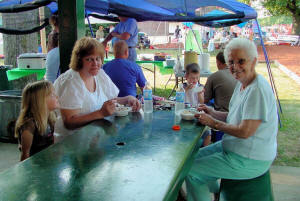 Friends and families found plenty of fun things to do and eat, including delicious homemade ice cream. Activities are mostly located in the park at the center of town, but historical sites are also open and the traveling Vietnam Memorial Wall greets visitors from the north.